It is advised to clear the cache after installing/uninstalling the magento mobile app extension. However, it is beneficial to flush the store Cache which deletes the content in the var/cache/. Step 2: In the menu tabs, click System > Cache Management. Step 3: From the cache list, choose the cache types you want to remove. 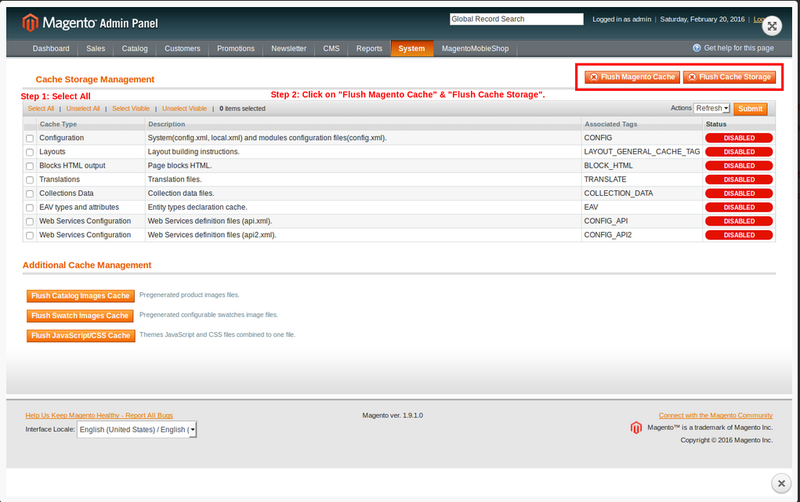 After selecting the cache types, click the “Flush Magento Cache” and “Flush Cache Storage” situated on the top right corner. Step 4: From the “Actions” dropdown menu, select “Refresh” and click the “Submit” button. Step 5: To implement the changes, logout from the Admin Panel and login again. These steps will help you free the cache memory of your shopping app. If you need assistance or any other information regarding the same, email us at contact@magentomobileshop.com and we will contact you.